Thomas Lopinski grew up in a quaint small town in Illinois called Georgetown with one stoplight, one high school, one square, one lake, one police car, and one hundred ways to get into trouble. He studied at the University of Illinois and later moved to Southern California with his wife and children to work in the music business. He is also a member of the Independent Writers of Southern California (IWOSC). His first novel "Document 512" won several awards and recognition in 2012-2013 from Readers View Reviewers Choice Awards, Best Indie Book Awards, IndieFab Awards and the National Indie Excellence Book Awards. His second novel "The Art of Raising Hell" is published through Dark Alley Press and is a Kindle Book Awards Semi-finalist for Best Literary Novel of 2015. 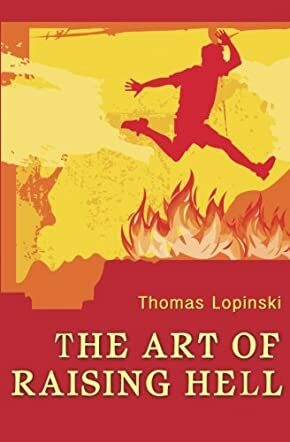 Thomas Lopinski’s The Art of Raising Hell is the story of young Ryan Johnson (nicknamed Newbie by his friends and throughout the book) and is set in the 1970s. Newbie and his father move to Bunsen Creek, Illinois, after the tragic death of his mom in a car crash. Newbie is intrigued and drawn to an older school mate, good-hearted Lonny Nack, and his philosophy of “running on all fours.” This means being unique, being yourself, taking risks and, for Lonny, sometimes breaking a few laws and ending up in the detention center. Newbie and his three friends get caught up in all the usual and some not so usual experiences, challenges, relationships, sadness, and lessons of normal growing up and being teenagers in high school. But Newbie, always affected by his mother’s death and influence, finds his deepest connections are with others who have experienced similar traumas. He seeks some sort of revenge and justice for his friend Sally, and the suspicious tragedy that eventually befalls Lonny. Lopinski is a brilliant writer with a distinct authorial tone. He writes in first person, as Newbie telling his own story, and draws the reader right into the plot. All the characters in The Art of Raising Hell are well depicted and believable, particularly Newbie and Lonny. The plot goes at a good pace with plenty of action, surprise and suspense. At the same time the inner worlds and motivations of the main characters are explored with great insight and move the story onwards. As Newbie grasps Lonny’s philosophy of living in a way that is true to the soul, so the reader experiences his gradual blossoming into a young adult who is developing the wisdom to become himself.